Western Blot analysis of POLS expression in transfected 293T cell line by POLS monoclonal antibody (M01), clone 2F8.Lane 1: POLS transfected lysate(59.9 KDa).Lane 2: Non-transfected lysate. Western blot analysis of POLS over-expressed 293 cell line, cotransfected with POLS Validated Chimera RNAi ( Cat # H00011044-R01V ) (Lane 2) or non-transfected control (Lane 1). 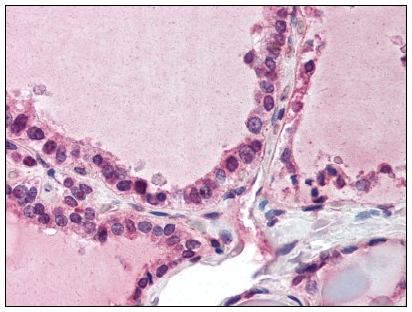 Blot probed with POLS monoclonal antibody (M01), clone 2F8 (Cat # H00011044-M01 ). GAPDH ( 36.1 kDa ) used as specificity and loading control. 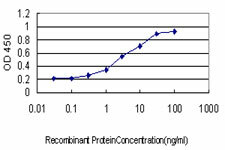 Detection limit for recombinant GST tagged POLS is approximately 0.3ng/ml as a capture antibody. 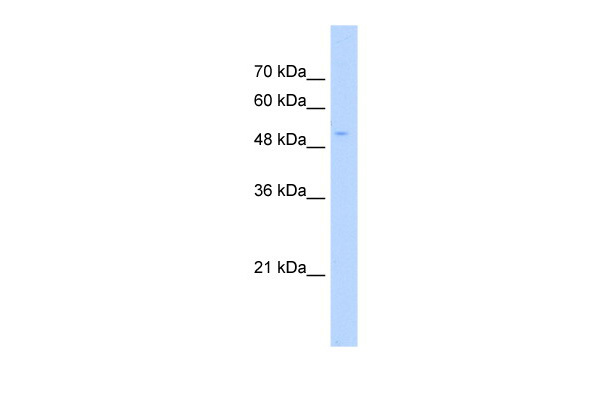 Western Blot analysis of POLS expression in transfected 293T cell line (H00011044-T01) by POLS MaxPab polyclonal antibody.Lane 1: POLS transfected lysate(59.90 KDa).Lane 2: Non-transfected lysate. Western Blot: Detection of TRF4-1 in HeLa cell lysate with anti-TRF4-1 antibody (AP08399PU-N).